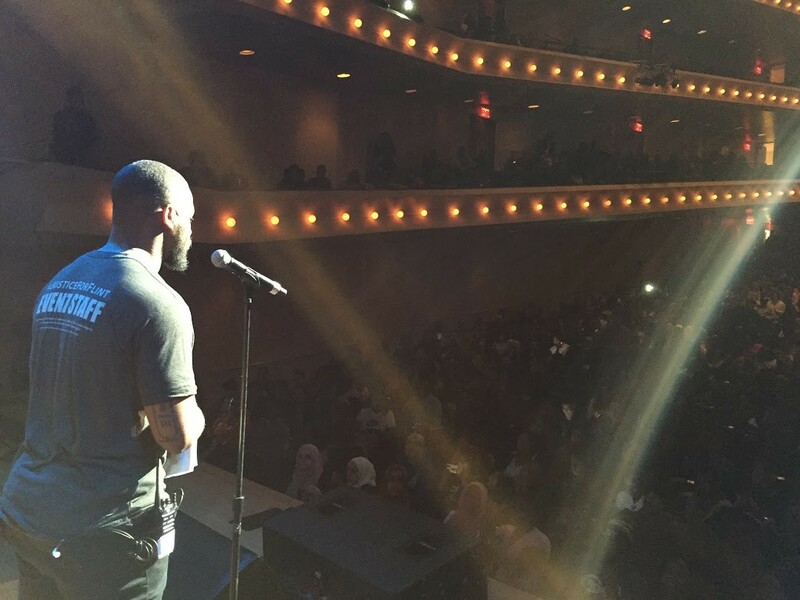 In the tradition of Black actors and artists like Harry Belafonte who used their celebrity to help advance the Civil Rights Movement, Blackout for Human Rights organized a free public event, #JusticeforFlint, at Flint’s Whiting Auditorium on Feb. 28, as well as an online fund drive. A surprise appearance by Michigan-born Motown music legend Stevie Wonder capped the performances by artists from Michigan and around the country. On-stage testimony by Flint residents and young organizers highlighted a spirit of resilience and struggle, but also the personal cost imposed on them by the state government. A high school student who was told only a few weeks ago that water at her private school was unsafe said students had originally been directed to buy water from vending machines. Elementary school students talked about skin eruptions and other illnesses from washing with lead-laden water and of bathing with baby wipes. Dr. Hanna-Attisha continued: “Lead, even before this, was an environmental injustice. Our Flint kids had higher lead levels than those kids in the suburbs, even before this. And after this, those disparities significantly widened. That is the last thing our kids need. They already have too many obstacles for success.” She cited Flint’s 40 percent poverty rate and lack of nutrition sources. “Our work is just beginning. It will continue for decades to come.” She thanked the performers for providing the best medicine — laughter and enjoyment. 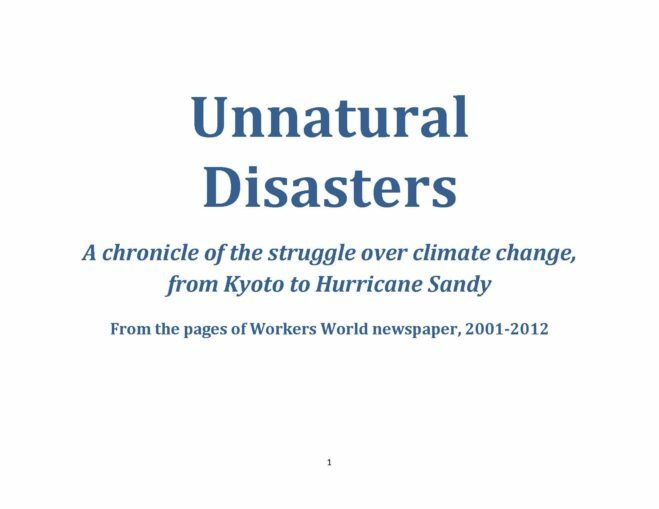 Clarence Thomas and Stacey Rodgers, ILWU Local 10. Latino/a community representatives sat on stage with actor and author Hill Harper and explained that without Spanish language information many Latin American families attempted to make the water safe by boiling it — which only concentrated the lead levels. Undocumented residents are fearful of bringing their children in for testing because of the climate of repression. Harper spoke strongly for Black-Brown unity against common oppression. Filmmaker Ryan Coogler, the founder of Blackout for Human Rights, is from Oakland, Calif., the home of militant International Longshore and Warehouse Union Local 10. 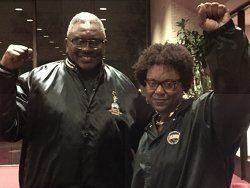 A delegation from Local 10 came to Flint, including its past Secretary-Treasurer Clarence Thomas and Stacey Rodgers, who authored a resolution “For Labor Action to Stop Flint’s Poisoned Water Crisis and Hold Michigan’s Governor Snyder Accountable.” It was passed unanimously by not only Local 10 but the San Francisco Labor Council. Read the full resolution at tinyurl.com/j6gx2ao. Coogler’s first film, “Fruitvale Station” (2013), followed by the critically acclaimed “Creed” in 2015, was made to expose and stop blatant police killing like that which took Oscar Grant’s life in 2009, captured for all to see on cellphone video. As the videoed killings of Black and Brown men, women and children have continued and accelerated, Coogler and his colleagues founded Blackout to use their considerable creativity and talent for the same purpose. According to a press release for the event, Blackout for Human Rights is a collective of filmmakers, artists and activists “devoting their resources to address the staggering number of human rights violations in the United States.” The collective includes Michael B. Jordan, Ava DuVernay, David Oyelowo and many others. In January Blackout hosted #MLKNOW at Riverside Church in Harlem. That event didn’t shy away from the revolutionary words of slain Black Panther leader Fred Hampton, which were also heard in video clips shown on the Flint screen. As of Feb. 29, #JusticeforFlint raised more than $145,000 in donations to help Flint organizations. A Flint People’s Hearing is planned for March 5, sponsored by Flint Rising, Flint Democracy Defense League and Michigan Faith in Action.